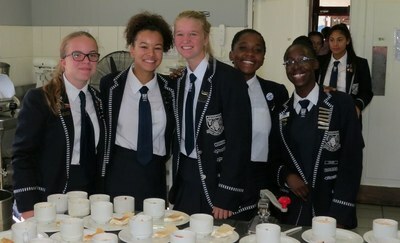 The Rhenish Old Girls' Union (ROGU) annually hosts a luncheon combined with their AGM. For the past number of years, this has been hosted in the hostel dining hall with the assistance of the Rhenish Learner Council who help with the set up and serving of the meal. Saturday was a beautiful celebration of the bonds that connect Rhenishers across the ages ... living proof of our catch phrase, "Once a Rhenisher, Always a Rhenisher". The enthusiastic beat of the marimbas greeted the old girls on their arrival and the Learner Council were on hand to welcome their 'sisters' back to their alma mater . It is always a joyous occasion, a time to reflect on times past, friends we have in common, shared experiences and happy memories of the school we love so well. The Dining Hall came alive with the laughter of our old girls as they reflected on their time spent at Rhenish, recollected teachers, escapades, 4Ms of their own and also marveled at the changes they could see. Leaving school at 18 is always so exciting as the future stretches out ahead of you so invitingly, so large. Coming back - at any age - is just as exciting, as it gives you the opportunity to reconnect with not only your friends of old, but with your younger self.